Class Motto: "Learn from the Past; Build for the Future." A while back I received an e-mail from a photographer who was hoping to get the job for the Class Photo for the 64/45 Reunion. He attached some samples of his work, among which was the panoramic of the Class of 1958 50-Year Reunion. I checked, and you do not already have it posted. So, it is attached for posting to their reunion page. Terry Elvington is taking orders. If he receives your order by May 1st, you can pick up your order at the reunion. If you want it mailed, include $4 for shipping and your shipping address. A reunion planning meeting will be held at Tzina Zwerdling Richman's home tomorrow night, Wednesday, 3/19/08 at 6:30pm. Several of you have volunteered to help with our weekend and now is the time to step up to the plate. This meeting will be your opportunity to sign on to assist with some of the work that will need to be done. Call or email Tzina to give her an idea of how many to expect. And don't miss the opportunity to enjoy the sunset over the James from her home while enjoying your favorite libation. 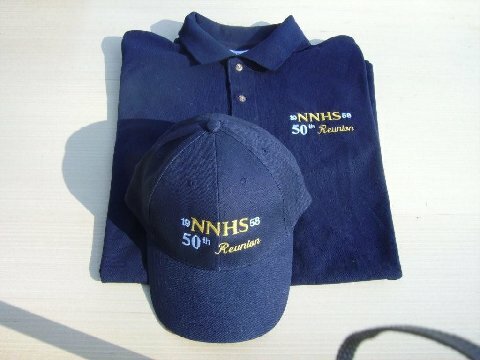 Terry Elvington has been in touch with someone who can provide hats and polo shirts on order. Sample shown in the photo below. Perhaps a decision about offering and pricing of these items will be made at the meeting tomorrow night. If a decision is made, a preliminary order could be placed via email. The final order will be confirmed with receipt of your check. Also Allan Willey and Bob Beasley will give an update on the progress on the "Memory Book" project. If you are local, can participate in the discussion and decision making process, and/or can volunteer to assist in the final planning and preparation of the activities, please try to attend the meeting. $119/night. Make reservations before 4/17/08 to get this special rate. 6-7pm -- Reception, cash bar. 8pm - ?? -- program and dancing to DJ playing our music. Note: A photographer will take a group picture of the class members in attendance. Cost for package (both nights) is $50/person. Don't forget to send in your information for the "Memory Book". All participants will get a copy. Thanks, Joe! Y'all have fun! Christmas is wonderful; what it means is better, His Birthday, or rather the day that most of us choose to Celebrate it. However, there is something else about December. Winter begins, the cold, bone chilling dampness that nips at our fingers and nose and finally makes it's way to the center of our very bones, and then begins to work its way from the inside to the outside. Even for those that have moved to escape it, the lingering memories, thought about long enough, can still cause a shiver, making it impossible for some to find warmth no matter where they look. Winter is good, just like Mondays. Without Winter, we cannot have a Spring; without Monday, we can not have a Friday. Without January, February would not come bringing the faintest promise of days with just the tiniest bit more light at first, but by the end of February, the sun hangs longer in the sky and that promise of longer daylight hours is no longer a promise, it's a kiss, given by God to let us know Spring will come for certain again this year. And this year will be a Special Year for those of us that graduated with the Class of 1958. We celebrate because we can, because we want to, and because it is our right. We have earned it, and it is good. If you are thinking about NOT coming, rethink it. There will be not just a reunion, but a rejoining of spirits, and friends that haven't seen one another for years. We have known each other for at least 50 years, a lot of us much longer, maybe since first grade. Where else can you go and find that kind of bond? Family is not the same. We are speaking of classmates here - important to us for a thousand and one reasons. Those that are missing....we need to find you, now ! For those of you that are not from the Class of '58 but know of a friend or relative that does know of someone that was in the Class of '58: please do them a favor, beg them to let us find them, lead them to the Newsletter, do whatever you can. We need them, need them to be complete, to be with us as we Celebrate this wonderful passing of Fifty years. Examine your reasons for not wanting to come. Just not interested ? Come anyway, let us change your mind, let us make you glad you did change your mind. The majority of us will not get a chance for the I00th. I can promise you one thing...you will once again feel the headiness of youth, if just for that one weekend or one night, whatever you can manage, and you will be glad you came. Even though it will be Spring, you will finally find the warmth...without even looking. We have selected a 2008 weekend for our 50th. We are still struggling with the place and format. The weekend selected is Friday 05/16 - Sun. 05/18/08 (THAT IS 2008). We haven't decided whether we will have organized activities on 1, 2, or 3 days. Let us know what you think. Do you want to attend our 50th? If so, What type of weekend you would be willing to support? Would plan to stay in the host hotel for 1 or 2 nights? The host hotel has not yet been selected. We think we can get the new Marriott for about $130/night (DOUBLE). It is in the new NN City Center and has a lot of action around it. If you haven't been in NN for a while, I think you will be pleasantly surprised. We can also get a nice hotel in the area for maybe $89/double if you want to hold the cost down. 1. Most expensive: Friday and Sat. night activities at a host hotel. Room at hotel for gathering and visiting Fri. night. (probably $100/person). 2. Expensive: Sat. night dinner/dance at host hotel. (probably $75/person). 3. Medium expensive: Sat. night dinner/dance somewhere away from host hotel. (probably $60/person). 4. Least expensive: Sat. night heavy finger food and music away from host hotel. (probably $35/person). If we only put the Sat. night activity in the package, we can still provide suggested activities for Fri. night and perhaps Sunday breakfast/brunch for those who want to gather. It will then be up to individuals or informal groups to make plans. We really need to know which of you classmates are planning to attend from out of town and what type of activities you prefer and what would either encourage or discourage your attendance. We need to have your input now so we can evaluate our options at the 05/03/07 meeting. Send me your input. Let me know if you will be at the 05/03/07 meeting. "I held out my hands & asked where I could help & somebody grabbed me & pointed me towards the future & said, You've got your work cut out for you & I said, isn't there anything easier? & he laughed & said you could dig around in the past, but it's just busywork & that made perfect sense so I shrugged & started right where I was, along with everyone else."